This is the second article on those problems that occur with our Bounders that have elusive solutions. I present these solutions to assist you, and also to encourage you to share those niggling problems that you have tried to correct and have not as yet been able to. By sharing these problems we get answers from others, who may already have faced that same problem or may have the missing piece in the puzzle to solve your problem. Please write me with your unusual situation, or if you have time at a Rally, drop by our rig and discuss it with me. That is how we gain experience that others benefit from. Failure of the Air Conditioning Fan: One of the first times I took out my 1994 Bounder out this season, I noticed that my Air Conditioning (A/C) Fan was not operating on any speed, regardless of whether the A/C was on or not. Unlike most cars and trucks, the fan must operate to allow air to flow into the rig. On Bounder's (and almost all Fleetwood) heating and cooling systems the fan provides the airflow. After consulting the Ford Chassis manual, a check of the fuses for the low blower speeds, the high blower relay, the air conditioning control fuse and relay, all were OK. With the key on and the engine off, I could hear the operation of the electric motors that control the direction of the air (heater, vent, defroster etc). The green A/C light was also off. My next area of attack was the heater motor. In front of the passenger seat there is a carpeted panel that is screwed at the corners to a wooden frame that is assembly line stapled in behind the dash. Once you locate and remove the screws buried in the carpeting covering the panel, the panel can be taken out. In this area there are some control relays, and a fuse on the blower line. I assumed I had found the elusive fuse that would solve my problem. Such was not the case. All relays seemed to be operating correctly, and the fuse was OK.
After consulting the Chassis owner's manual and the Ford RV Chassis Service and Maintenance manual, I double-checked all fuses and relays in the black Power Control Centre. Some of the fuses were in different positions than indicated in the manuals. I removed each fuse in the circuit board and finally found the culprit: the Fan Control Relay Coil Fuse. This fuse provides power to the activating coil on the relay that switches the high current required to operate the Blower Fan, especially on its high speed. It also supplies power to the A/C clutch on the front of the engine-mounted A/C compressor. The problem started when the A/C compressor sat all winter without being activated. This year, we traveled to Quebec in early January and although the A/C compressor is activated in the defrost mode, it only operates when the ambient temperature is above 5 to 10 degrees Celsius. All of our driving was in much colder weather. Furthermore, we did not take our usual winter trip south, which would have activated the A/C system. Thus the A/C compressor sat unused for about 6 months and was sluggish starting up. When I replaced the fuse, and operated the fans everything was fine, when I started the A/C system by depressing the A/C switch, a rumbling sound could be heard from the engine area and with 10-15 seconds everything stopped. The fuse was rated at 10 amps, which is sufficient to protect the coil, but it is insufficient to handle the clutch coil on a sluggish A/C compressor. I replaced it with a 15 Amp fuse and cycled the A/C compressor on and off in short 10-second bursts for about two minutes, then left it on. The cycling circulated the lubricating oil within the cooling Freon and as the compressor began to rotate with less friction the noise subsided and the current required diminished. I now engage the compressor by operating the A/C for a few minutes each time I start my Bounder and everything operated properly. So what did we learn from this saga? Use your engine A/C regularly to keep the seals lubricated. Listen when you first activate the A/C switch and if you hear a loud or unusual sound immediately begin to cycle the switch on and off. If you're heater-A/C fan fails to operate, check all blower fuses and relays and all coil fuses feeding these relays. If no other visible problem can be found, remove the fan panel on the passenger compartment and check the fuse in the line to the fan blower. 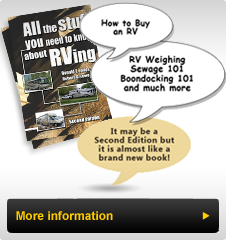 The chassis and RV manual may not accurately reflect the fuse panel layout of your rig so patiently check each fuse before assuming that you have eliminated the fuses as a problem.